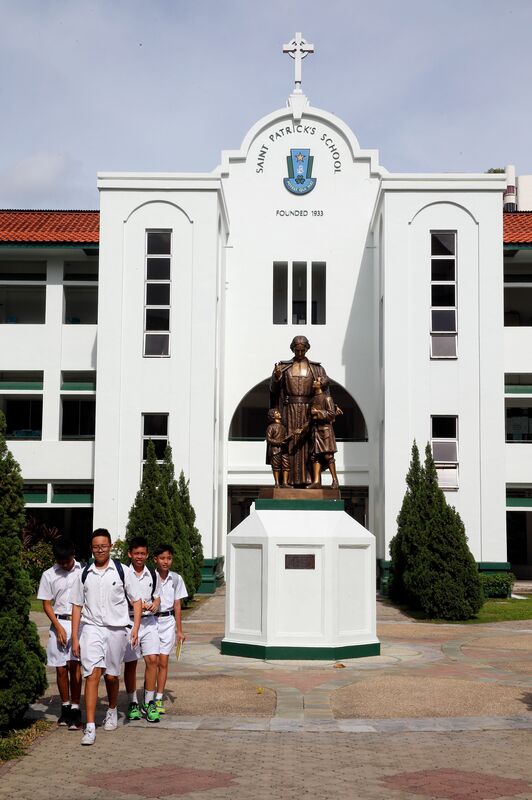 St Patrick's School has been a landmark in the East Coast area for more than eight decades. Today, all that remain of the original buildings in the all-boys secondary school, established in 1933, are its chapel and two adjoining buildings, but these pre-war buildings are rich in architectural and historical significance. The school in East Coast Road rests on 6ha of land and was founded by the De La Salle Brothers, a Catholic religious order whose vocation is teaching. It was given conservation status in 2004. Says Ms Yeo Su Fen, a senior architect at the Urban Redevelopment Authority (URA): "Unlike more traditional Catholic churches with ornate features, the school's chapel shows a strong Art Deco influence, characterised by the use of clean geometric shapes." Art Deco was a popular design movement in the 1920s and 1930s. She adds: "There is a rigour in the design of the chapel and the proportions are symmetrical and well-considered." Geometric forms are repeated in both the interiors and exteriors. At one end of the chapel, a large piece of stained glass is surrounded by a series of large concentric arches. Similar arches envelop the window grilles encasing stained-glass images made by the late Brother Joseph McNally, a former principal of the school and founder of the La Salle-SIA College of the Arts. He was also an artist and sculptor. These curves are replicated in decorative features on the pillars along the side. The chapel's facade is studded with rectangular windows - aluminium has replaced the original steel frames and grilles. Steel was a popular material of the forward-looking Art Deco age. "It was a new material to work with, in the age of mass production and the machine," says Ms Yeo. Other materials used in the chapel speak of 1930s Singapore. The lower part of some walls, known in architectural lingo as the dado, is covered with tiles made of rubber, a flourishing industry at the time. The school's architect, Irishman Denis Santry of the firm Swan & Maclaren - who also designed historical landmarks such as the Sultan Mosque and Tanjong Pagar Railway Station - combined tropical design with artistic eloquence. The high ceiling as well as the wide, overhanging eaves along the roof protected the building from the sun's heat. The height of the ceiling "gives an uplifting sense of spiritual space", notes Ms Yeo. The chapel has never undergone a full or major restoration. It joins two other three-storey buildings, known as the Brothers' Quarters and the Old School Block, in an H-shaped formation. During the school's early years, many of the religious brothers who were teachers came from Ireland. St Patrick is the patron saint of Ireland and Irish symbols such as the shamrock were inlaid on the floor of the Brothers' Quarters, where four De La Salle Brothers still live. During the end of the 19th century, its grounds, originally a coconut plantation, saw the construction of a seaside bungalow retreat for clergy working at another Catholic school, St Joseph's Institution, then located in Bras Basah. St Patrick's was of strategic importance during World War II. After Singapore fell to the Japanese in 1942, the school, which had served as a hospital for Allied soldiers, was used as the headquarters for the Japanese air force. The chapel was converted into a Japanese officers' mess. Another room served alternately as an armoury and hospital mortuary. After the war, the school was again used as a hospital for the treatment and rehabilitation of prisoners of war. Former WWII soldiers have visited the school, including a former Australian serviceman who returned as recently as 2013. In 1979, a former Japanese soldier also visited the school. In a letter cited in a book published to commemorate the school's 50th anniversary in 1983, one H. Shimura reminisces about living there as a 17-year-old soldier: playing basketball, singing military songs and buying fish at a kelong in the sea nearby. Mr Joseph Peterson, vice-principal of St Patrick's School, says the school took part in the Singapore HeritageFest last year. "We hope to continue with this as well as work on other projects with the URA to share the school's rich history with the public." This is a monthly column on heritage buildings.